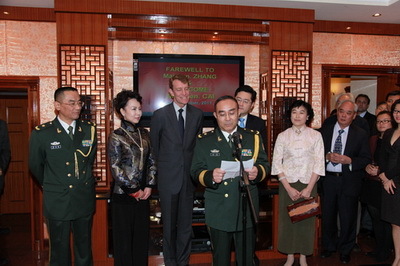 On November 24, 2011, the Defence Section of the Chinese Embassy held a reception for the departing Defense Attache Major General Zhang Jianguo and his successor Major General Cai Yong. More than 150 Chinese and foreign guests attended the reception. Air Marshal Chris Nickols, the Chief of Defence Intelligence, Air Vice Marshal L. J. Irvine, Director of Legal Services, Royal Air Force, Air Vice-Marshal M C Green, Director Information Superiority in the Ministry of Defence, and other senior officers were present on behalf of the British army. Charge D’affaires Qin Gang, section heads and some staff members of the Chinese Embassy also attended he reception. 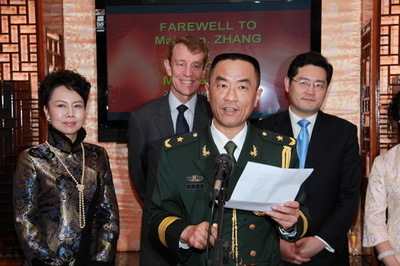 In his speech Mr. Zhang expressed sincere thanks to the senior military officers, officials of the Ministry of Defence, Defence Attaches from various countries to the UK, overseas Chinese, media, Chinese enterprises and the leaders and colleagues in the Embassy, especially Ambassador Liu Xiaoming, for their support and help. He said that in recent years the military relations between China and the UK maintain a good momentum of development and the military exchanges and cooperation are deepening. He was pleased to witness and personally participate in this process. Mr. Cai spoke highly of Mr. Zhang’s outstanding contributions to the development of the military relations between the two countries during his seven-year tenure. He expressed his confidence to contribute to stronger mil-to-mil relations and looked forward to more support and help from all friends in this endeavor. The Chinese and foreign guests paid tribute to Mr. Zhang and warmly welcomed Mr. Cai. The reception proceeded in a warm and friendly atmosphere.